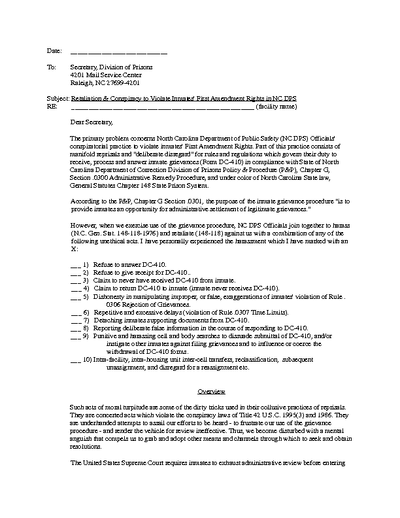 Administrative and medical retaliations continue by California Department of Corrections and Rehabilitation (CDCR) staff as retribution for any sort of participation in hunger strikes and/or show of resistance. Recent validation reviews have shown futile since CDCR is utilizing hunger strike and single cell write-ups as proof of [security threat group] association. Doctors first question, before denying all subsequent inmate request for pain management, is: "were you in the hunger strike?" 602s [grievance forms] are disappearing from inside locked metal boxes. MIM(Prisons) adds:Control units were developed as a form of political and social control within the prison system, and this blatant political repression against prisoners who protested against them shows that social control is still their purpose. The review process is a sham to allow the state of California to continue to torture oppressed people while pretending to make changes. We must continue the fight against these isolation units, but we know that real and lasting changes will only be made when we dismantle the criminal injustice system. In the short term we fight for reforms to improve the conditions of those locked in these torture cells, but the imperialists will not reform away their tools of social control. This is why we see the fight against the criminal injustice system as an integral part of the anti-imperialist struggle. We mourn the death of Herman Wallace, one of the Angola Panthers. 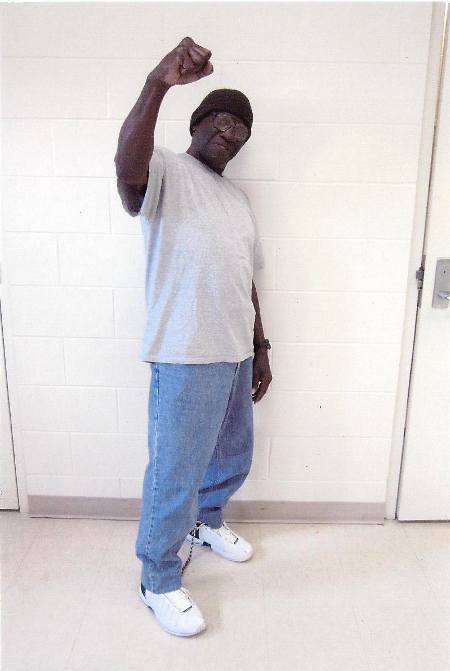 Herman died on Friday after a judge threw out his case, as a result Herman was able to die outside of prison. The fact that Herman was held the longest in solitary confinement — approximately 40+ years, speaks of the history of torture in U.S. prisons. For many of us Herman is much more than simply a prisoner who was held in the hole for decades. He co-founded the first prison chapter of the Panthers, and spent his time in prison serving the people. He dedicated his life behind the prison walls to educating people, ending the hostilities surrounding prisoner-on-prisoner crime and fighting guard brutality. For his determination to liberate his people he was framed for a crime in an attempt to neutralize him by sealing him in a cage for decades. Herman refused to surrender and he was an example to other oppressed prisoners to resist even in the dungeon. This example was too much for the state and he was denied compassionate release by the oppressors. His liver cancer is also suspect, we know the state has many dirty tricks in its arsenal. But Herman, like others who rise up in prison, understood that he might in the end pay with his life for this resistance. It has been reported in the press that Herman's last words were to the effect of "I am free" before he died. But Herman was already free, he was free while still in prison because he had liberated his mind decades ago, and this was his real crime that the state was making him pay for. Had Herman been a drug addict prisoner who preyed on other prisoners for a cellphone from the pigs or for a sack of dope he would never have spent over four decades in solitary confinement. Freedom comes from one's actions and this is something that the petty bourgeoisie does not grasp and so they will never be free. Those of us here in the SHU understand that at any time we can be free from torture by simply making up information on someone or debriefing. But like Herman many cannot fathom doing this to another human being and instead choose to build our nation and RESIST! And for this we are also met with torture. But like Herman we are also free, more free than many people on the outside whose minds are in many ways more chained than SHU prisoners. May the example of resistance displayed by Herman live on in U.S. prisoners! "It is dangerously inflammatory in that it advocates or encourages riot, insurrection, disruption of the institution, violation of department or institution rules (per Florida DOC rule book Section 33-504.401 F.A.C)." Sorry for not writing sooner, but I've been very busy. Informing you of why I no longer receive newsletters is not the only reason why I am writing. Our living conditions are disgusting. The cleaning chemicals are watered down to the point where they are not worth using. No bleach is giving to kill tough germs. In order to get good chemicals we have to pay one of the prisoners. Here at the annex we have air conditioning. In some of the dorms the air conditioning is broken. All windows are sealed closed so there's no fresh air. The ventilation system is very poor. The state wants the air conditioning set to 77 degrees, which is hot and does not keep germs down. Each bunk is about 2.5 feet apart and the head of each single bunk in the dorm that I am in touches each other, so it's easy to get sick from the guy in the other bunk if he's sick. Every six months existing prisoners, and every new prisoner, is supposed to receive new white under clothes and one new blue uniform (new prisoners). Instead we are issued used clothing upon arrival (boxers with piss stains or crust marks and boxers made from bed sheets, and white shirts with holes or bad underarm stains). Prisoners go through hell and back trying to get new whites every six months. Some of the clothes look as though they have crawled from under a rock or been in a knife fight. Each prisoner is given a fishnet laundry bag to place whites and personal laundry in. When these clothes are washed the laundry bags are jammed packed into the laundry to the point where the clothes don't even move inside the machine because it's overloaded. When the clothes do come back they are no longer white, but look as though they were washed in rusty water. Towels are cut in half and issued half to each inmate. No wash rags are given and every 7 days 1 bar of hotel soap is issued that is good for 1 or 2 showers. The chow hall is more than just disgusting. It should be closed down. You either don't eat and starve yourself to death or eat and take a big chance on getting bad health problems. Besides the fact that the Florida Department of Corrections has been serving the cheapest meat and other food products on the market since 2009, the portion of food that is served is not the correct portion for a full grown man. Even a child would ask for more. The bad thing about it is most of the time the staff members make them serve with a smaller serving scoops or they water down the food and say it's the correct serving. Just one or two hours after each meal you're hungry again. Some meals are so small it's as though you didn't eat at all. And if a server doesn't want to shake the spoon or water down the food they will be sent to the box for refusing to work for 60 days, and with 60 days gain time lost. If you don't have family or friends sending you money you're out of luck, which causes people to rob or steal from the ones who have money. A lot of times the cups, sporks, and trays do not get washed with chemicals, only hot water. Sporks are issued out greasy, cups are issued with dirt around the rim and muck on the inside. Sometimes there are drops of juice left in cups from the last person and trays are served with residue from the last man. Sometimes the food is served spoiled and if you complain they tell you to eat or get out. The worst thing is that the kitchen is infested with roaches. Most of the time they come out while the food is served and at night it looks like a million of them all over the cups, sporks, trays, and cooking ware. A prisoner got transferred today because he killed about 100 roaches and sent them to the state capital, the health department, and a news station in a letter marked legal mail. The state called the prison and ordered that they get the prisoner off the compound. The correctional officers (C/Os) take shanks, tobacco, cell phones, or drugs from out of their pockets and place it on the prisoners or in their lockers or under the bed to get prisoners sent to confinement or close management for up to a year. When they put prisoners in cuffs and walk them to confinement the C/Os start yelling "stop resisting" when the prisoner is not doing anything at all. They shake the prisoner to make him look like he is resisting so they can slam him on the ground and kick him, place their knee in the prisoner's back or have the other C/Os jump on the prisoner. They take their authority and abuse it. They take non-violent offenders and turn them into violent offenders. We call this the Department of Corruption. I can go on about the poor treatment of medical: getting charged $5 to get cursed out or get a handful of ibuprofen and told to take lots of water for almost any medical problem. Or the poor teaching skills in education by the teachers who say their job is not to teach. Or the canteen prices that are so high it makes $100 look like $30 and the sale of items that say "not for individual sale" still being sold individually. Prisoners can't even write a petition without getting charged for trying to start a riot. We don't get any help by writing grievance most of the time. They either go unanswered or some form of retaliation is afflicted on the prisoner who writes them. We seek help, answers and true care, custody, and control. Not corrupt, custody, and control. MIM(Prisons) responds: These reports of inhumyn conditions, abuse at the hands of the guards, and illegal censorship of anti-imperialist literature are far too common in the Amerikan Criminal Injustice System. This prisoner writes that he seeks help and answers. Unfortunately, the answer is that prisons are not about rehabilitation, or even just custody, they are about social control. And so this sort of treatment is actually serving the intended purpose. We won't be able to change it without a fight, and fundamentally it won't change until the system changes. We might win some small battles for reform though, while building to change the whole system. And for that we need to pick our fights carefully and build support as broadly as possible. There is no simple form of help that we can offer to end this brutality. But we can work with our comrades behind bars to build a base of support from within, and take on strategic battles that may win some reforms. We provide educational and organizing material, and we will support your battles from the outside. This must all be done in the context of building an anti-imperialist movement that will fight to eliminate the capitalist system that requires a criminal injustice system as a tool of social control. Only when we put in place a government that serves the needs of the vast majority of the world's people, rather than one that serves only a small minority of the wealthy, will we make significant steps towards ending oppression. 2 October 2013 - Right now myself and 21 other comrades are on hunger strike. We started on Sunday 29 September 2013. Our purpose for the hunger strike is to bring an end to all the unconstitutional conditions that exist in segregation. These conditions include inadequate cleaning supplies, regular use of excessive force whenever they put prisoners in and out of cells, tampering with prisoners' food, denying prisoners access to recreational time on the yard, and failure to respond to grievances. We are also striving to receive new law library books because correctional officers destroyed the ones we had. We're also striving to get educational and other help programs for prisoners with long-term segregation time. Most prisoners who are confined in Pontiac Correctional Center are here for staff assaults, and/or are labeled as "STG" (Security Threat Group) status. It is well known that Pontiac C.C. is a 'retaliatory facility' for prisoners with the above labeled offenses. That's why most prisoners who come here with a year of segregation time end up with five, six, seven years segregation time! This is all part of the oppressor's plan to keep places like this operating. That's why me and the other comrades on strike are writing local newspapers and organizations based around the country to receive some outside support. Me and my comrades have embraced and accepted the United Front for Peace in Prisons Statement of Principles and plan to propagate them amongst the prisoners here in segregation. We see the necessity of all five principles being put into use, as a means to unite and gain unity amongst prisoners here, and hopefully to help free some from the psychological chains of mental slavery. MIM(Prisons) adds: Just last summer we received a report on a hunger strike at Pontiac Correctional Center for similar demands, and in February a similar strike was reported by others. Our information is limited due to censorship problems in Illinois, but we are working to get better follow up this time around. The problems at Pontiac were exacerbated last winter after the closure of Tamms Supermax, which, for years, was the primary destination for jailhouse lawyers and prisoner activists. One comrade reports from "North administrative unit where it's a constant battle with our rights and living conditions. Since the closing of supermax Tamms, a lot of guys are now being housed in this unit wrongfully." As long as the oppressor nation feels threatened by the oppressed they will not give up their tools of torture and social control willingly. Mission Statement: Libertas est naturalis facultas ejus quod, cuique facere libet, nisi quod de jure aut vi prohibetur. Liberty is a person's natural power which permits one to do as he pleases. Break the silence about oppression. Announce officially that we strive for unity and peace. Proclaim our independence from the United $tates government and all its branches, right down to the local police, because this system does not serve us. Educate comrades to bring an improvement of the mind, and to coach, cultivate, direct, enlighten, guide and prepare them to live above oppression through education and upholding the five principles of the United Front for Peace in Prisons. VOL fully supports MIM(Prisons) and upholds the five principles of - Peace - Unity - Growth - Internationalism - and - Independence. 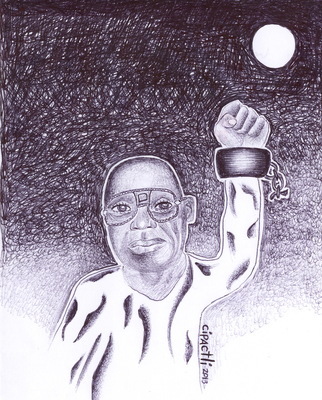 We honor Black Panther Herman Wallace, who died on October 4, 2013 after spending 41 years in solitary confinement in a Louisiana prison for allegedly killing a prison guard. These charges were always suspect, and on October 1 a U.S. District Chief Judge agreed and overturned his conviction, ordering his immediate release. Despite the State of Louisiana's attempt to block the release, Wallace was able to spend the last two and half days of his life out of prison with family and friends. The fact that Wallace had only days to live was well-known and likely played into his release. On the same day of the decision, his close comrades, Robert King (released in 2001) and Albert Woodfox (still in solitary confinement) were able to visit him due to his dire condition. (1) Together they made up the Angola 3, three of the longest to spend time in solitary confinement. Woodfox is in his 41st year in a control unit and is still locked up. The movement to free the Angola 3 has been championed by a dedicated group and echoed by supporters of political prisoners for decades. And the three, who formed a strong prison chapter of the Black Panther Party before being put in isolation, have continued to stay politically sharp and struggle for the rights of oppressed people. Robert King has been dedicated to not just supporting his two close friends, but opposing the Amerikan criminal injustice system. While we recognize their indominable spirits, and the pleasure Wallace must have felt in his last few days, the tragedy of wasted lives in U.$. torture chambers remains unacceptable. These men, who became dedicated revolutionaries because of the adversities they faced, were prevented from fully acting on those aims by a system that intentionally framed and isolated them for political reasons. The state wants to brand activists like the Angola 3 as "cop killers" when in reality they were dedicated to a life of serving the people. They were individuals who could have transformed the destiny of New Afrika, and supported the liberation of all oppressed people from imperialism. Instead, Wallace was tortured by Amerika for four decades, until he was within days of death. The case of Herman Wallace epitomizes the politics behind the United $tates's sanitized version of torture, in what is the largest mass incarceration experiment in the history of humynkind. And while it may be easier for some to support a Black Panther framed for killing a cop than to support a Crip accused of being a "shot caller," we must recognize the continuity between them. Otherwise we only spend our time on the individual cases, without addressing the system. We respect the work of the Angola 3 Coalition and groups like it. On the other hand, we should not be satisfied with victories like the release of Herman Wallace 2.5 days before he dies. We celebrate the organizing that has reached international attention in California in recent years, where prisoners of all backgrounds in long-term isolation have stood together to attack its very existence. While even that is just one piece of the system that must be addressed, we can best pose a real challenge to this systematic use of torture that is used by the Amerikan oppressor to control those who might challenge their hegemony over the world by organizing all those affected by it. 1. Herman Wallace, the 'Muhammad Ali of the criminal justice system,' joins the ancestors, SFBayview, 4 October 2013. 2. Al-Jazeera, 7 October 2013. On 9 September an organized collective of over 30 prisoners representing the North Branch Correctional Institution (NBCI) movement for humyn rights submitted demands to the imperialist overlords in regards to the inhumane, unjust and degrading conditions here. The vanguard of this "demonstration" was determined by pigs to come from the SMU, D tier. Their notice of infraction reports read, "A mass of officers was assembled and a cell to cell inspection of the entire tier was conducted." Inside the prison, the grunts feel the movement has been suppressed, but the truth is even their tactics of not reporting strikers in need of medical attention, destroying personal effects, and elevated level of all previous oppression had no bearing on the suspension of the protest. The suspension is based on the collective recognition by the Governor, Secretary of Public Safety and DOC Director that change is needed and imminent. A total review has been issued and guarantees of policy change are at hand, as ambiguous as they were. Since June 2013, NBCI has been on lock-down status. The "new policy" currently being implemented places the entire prison on a "level" system. Their answer to a "return to normalcy" is to allow one hot meal a day in addition to the two bags, one hour of outside recreation a week and one shower a week. Those in general population get one 15 minute telephone call a week as well. In addition, butter has been re-issued to bring the diet calorie count back to pre-lockdown levels. The pigs attempted total control through all means including the withholding of adequate required calorie count. It doesn't seem like much, but 300 calories of butter removed from a 2200 calorie diet does have an effect. Especially when bags are often shorted or withheld. The ever popular "air bag." Many lawsuits and grievances have been labeled moot in the wake of the drafting of the new STG/step down program as it will supposedly address many of the main demands, like ending indefinite Administrative Segregation. However, nothing currently has been published and I for one hold reservations. When final products have been issued and all fall out dealt with, if copies suffice, I will send them for review. There are a few soldiers so sick of the outlandish psychological torments that they utterly refuse to eat until they are removed or die. We have tried to reach and support these brothers as we know news reporting ceased a while back and we don't want good soldiers losing themselves to a battle when the war isn't over. I persynally hope to unify more brothers for a future response for what will most likely be a failed reform, but time is needed to allow the overseers to implement their newest tactic in humyn warehousing and degradation. Then our time shall again be at hand to show the flaws of imperialist bourgeois ideology of suppression and exploitation. MIM(Prisons) responds: This comrade was organizing around the September 9 day of peace and unity campaign to promote the United Front for Peace in Prisons. It is true that our organizing will go in cycles, with some set backs, and then some forward progress. We are never optimistic that promised policy changes from the DOC or government will result in any positive changes for prisoners. But we can use these set backs to educate others about the failure overall of the criminal injustice system and point to these examples for why we need to organize outside of the system for lasting and fundamental change. These are all good examples of the importance of building an anti-imperialist movement, rather than just fighting small reformist battles. We look to the examples of socialist China to see what is possible in terms of revolutionizing prisons, and society in general. That transformation required the seizure of power from the capitalists and the reorganizing of the economic structure of the whole country. But just as that transformation began in remote villages of China, we can start it today in those who are hidden away in the prisons and control units of the United $tates. I do all I can here to educate prisoners in the science of revolution. I share Under Lock & Key, I pass MIM(Prisons)'s address around, I conduct study groups, I raise consciousness and awareness while showing solidarity. Yet, the Texas Department of Criminal Justice officials are agents of repression using all kinds of divide and conquer tactics against these efforts. The other day I was conducting a study group in solitary confinement and the pigs were using disruption by instigating a racial argument between two Black prisoners and a Mexican prisoner. I tried to keep the peace and unity among prisoners, but the pigs are constantly breaking the unity and provoking racial conflict. I tried to intervene by telling these three prisoners to stop arguing about insignificant things and to set aside their differences and come together in unity, solidarity and cooperation. Then two of the Black prisoners started caling me "wet back." I just had to terminate the study group at that moment to prevent further altercations and racial conflict among these three inmates. I had similar experiences in the past when I tried to educate fellow prisoners; sooner or later the pigs manipulated the situation and use these ignorant inmates to turn against me and start calling me racial slurs. Look comrades, I have to be very cautious when I give your address to some of these prisoners because some of them are agent provocateurs, snitches, double agents, pretenders, informants and just brainwashed. So be aware of this matter. I just don't let these pigs get to me with their dirty tactics of divide and conquer. Some comrades over here are willing to learn, others are just playing games, and others are just brainwashed and it will take too long to make them conscious of revolutionary knowledge so I rather concentrate more on those comrades willing to learn and to assimilate Maoism into their thinking. MIM(Prisons) responds: This report from a United Struggle from Within (USW) comrade is an example of United Front work among the imprisoned lumpen. This is the more tedious stuff that dedicated comrades must engage in over years and decades before getting to more glorious examples like 30,000 prisoners refusing food on the same day in California. So we want to recognize all who, like this comrade, keep working and not letting the pigs get to them. It's true those who follow the pigs' manipulations are ignorant, and someday they will probably recognize that and feel great shame. But this story itself is an example of a teaching moment. By setting a good example, others learned something that day about the roles of the pigs because of the efforts this comrade made to build unity. And it is by consistently providing examples like this to the masses that ignorance is overcome. When an individual overcomes their ignorance and opens up to new ideas, those are the people who should get your persynalized attention to develop their theory and practice. Finally, we are aware that many people write us with bad intentions. Some have requested that we not send materials to such people. But this allows the very people we are trying to avoid to manipulate us into censoring ourselves. And in the current format of our work, there is no certain way for us to identify all pigs. As we have written in articles about security in the past, we must judge people based on their actions, and only give out information on an as needed basis. So we are very conscious about what information is public and what is not, and we will spread public information as widely as we can. As we recently wrote, comrades should not mistake Under Lock & Key subscribers for USW members. Just because we send someone mail, does not tell you anything about our assessment of that individual's political reliability.